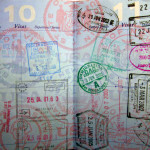 Although, modern passports are embedded with a microchip, which broadcasts a radio frequency. Unfortunately, identity thieves have learned how to “skim” this frequency to get access to your information, without even having to steal the physical passport. (They do, however, have to invade your personal space to do so, as the chips in passports are “passive” chips that only broadcast when they’re a very short distance from a card reader). There is a good deal of concern that stolen passports could be used not only to access the owners’ private information, but also to aid in terrorist activities. Stolen passports can be “doctored” by skilled fakers and used by terrorists to travel under false identities. If your passport is stolen while traveling, it’s important to immediately notify local authorities as well as your country of origin’s embassy. You may need other official documents such as a birth certificate or driver’s license in order to receive a replacement passport, so it may be a good idea to travel (carefully) with one or more of these other forms of identification. Even when at home, you should store your passport in a safe place.